You have 250 words (the length of this blog post) to describe your novel in the way that describes it accurately, and in the most appealing way. Go. No, not the dreaded synopsis, but the short description that readers will see alongside Everything Love Is on Bloomsbury’s website, on Amazon and copy-pasted into the beginning of many reviews after publication next year. It sets the readers expectations and hopefully whets their appetite. My editor has just given me her first draft to review. As the one other person who has read this book several times and put a huge amount of effort into making it as good as it can be, she is brilliantly placed to do this and you can see that in the way she managed to encapsulate the novel in so few words. As with The Night Rainbow, Everything Love Is is not a book that is easy to describe. It’s not “The next” anything. As I joked on twitter – No Girls, No Trains and Nothing Tiny: You Will NOT Believe What Happens Next. As I ponder how to get this description just right there’s a lot to consider. There’s a temptation to use superlatives (flipped into an actual book title by Dave Eggers – as pinched for the title of this post), or to second-guess what readers might feel as they read it. An option to hint at twists. A need to avoid clichés. What makes a description both believable and enticing? What do you think? 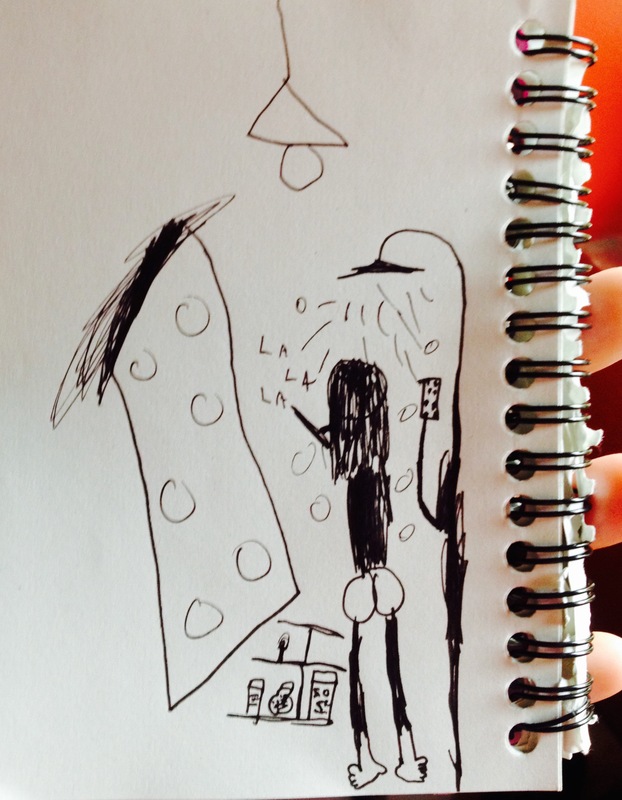 *I wasn’t sure what image to use for this blog post, so this is my 7yo’s drawing of me singing in the shower. Leave the final sentence of the blurb as a question that can only be answered by reading the book. Do we have to wait for the book to read the 250 words? What would be interesting is if editors tried to do this the other way round — write 250 words describing books they’d love to publish and then commissioned writers to produce them (a bit like screenwriting). They must have a good idea of what type of book is going to sell (and that they’d enjoy) so it would be interesting to see how well those ideas matched with what writers actually put into tens of thousands of words. This is part of the basis for the Snowflake Method of writing – start off with a mini-synopsis and expand on each sentence. The trouble is, if someone comes up with an amazing idea, there’s no guarantee of the quality of execution. There are literally thousands of books that could have the same synopsis but vary immensely in quality. What if *readers* wrote 250 words describing books they would like to read, and the best ideas were voted up into a pre-funded kickstarter, and then authors pitched to be the one to write it? Not sure agents and editors would like that idea! Is it possible to avoid cliches? Isn’t the blurb, the one place they’re expected? Just about every book I can think of alludes to heart-breaking, spell-binding, evocative, action-packed, edge-of-your-seat, tour de force, masterful, brilliant, family saga through the ages, coming-of-age and so on. Serious suggestion: Do it the other way round. Start with your elevator pitch – or whatever you say when people ask what your book’s about – and flesh it out? You’re right, when you only have a couple of adjectives to pitch a novel, you are pretty sure to end up in cliché territory. Of course as soon as we settle on a satisfactory description I’ll be sharing, but there’s still a year of pre-publication work to go, so no hurry! I think it all depends on who your readers are and why they would be picking up the book. When I go in to the Arch there are LOADS of recent, English books. I figure it is the local english population that buy them at the airport, read them over their holidays and then drop them off. I get a kick out of reading the backs of the book. A lot of them are very, very cliché and so for the most part, I just put those ones back. It makes me gag. But I think if the story and writing are on a higher level, those superlatives just aren’t necessary. I read the descriptions in Oprah’s picks and they often make me want to read the books. I don’t have examples in front of me just now, so I can’t say why. I am reading a book right now just because on the back it said the author could be up there with the very great american authors. It’s a really, really well written novel. I didn’t even really read what it was about before picking it up. So, just to say, there is something that can attract an audience that doesn’t depend on gagging superlatives and clichés. Yes, I think that’s the trick, to be compelling but with restraint. Easier said than done. Would love to know what you’re reading! I’m sure your next novel will be a heart-breaking work of staggering genius, as was your first, and I’m very much looking forward to it. But I’m also reassured that others have this problem in composing the back-cover blurb. I’d worked on mine back and forth with my editor until we were both pretty pleased with it apart from one small phrase on which we disagreed. So I showed it to a couple of people to get their opinion on that one part. Instead they said we’d made it sound like chicklit (which it very much isn’t). Still don’t know how that happened, but it was a narrow escape. Thank you, Anne. I think my books are less works of genius and more works of extravagant bloody mindedness. Actually, that sounds quite good as a blurb. I’m glad you’re happy with your copy. In the end of course it is all very subjective, but publishing houses will have a good idea what will engage retail buyers, who in turn should know what tends to sell, so it’s great to not be alone in this!